How could we improve the training? I don't think it can to be honest! Superb lecturer by the way he really knew his stuff. Fast Lane’s FLEX classroom service helps provide more courses in more subjects and disciplines than ever before, offering expert instructor-led courses and tutorials. 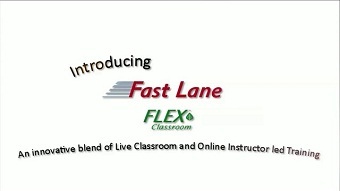 Blending traditional classroom teaching with online instructor-led training – Fast Lane’s FLEX classroom can fit effortlessly into the lives of professionals, students and organisations with minimal disruption. Remote students can benefit from the online tutorials with voice and video training from industry-leading experts and local students. Offering both participatory and passive learning modes, the FLEX classroom also provides breakout rooms for remote and local students to discuss ideas and share knowledge. FLEX™is about delivering an extensive, quality training experience. All courses are delivered in real time by Fast Lane's leading Subject Matter Experts across the region, direct into our state of the art training facilities. For more information about the benefits of the FLEX classroom system from Fast Lane and the individual courses provided, do not hesitate to call our dedicated team on 0845 470 1000 or email at enquiries@flane.co.uk. Without leaving the comfort of your home, contacting Fast Lane could open up the next stage in your career and professional development. View our full UK&I training schedule below or click here to view our EMEA FLEX™ schedule. This course is guaranteed to run. Please see our complete terms and conditions for full details of this offer. Citrix Virtual Apps and Desktops 7.1x Administration This is a FLEX course.